Along the path leading to the camp is a tall tree with a bear trap on the ground under it and a set of bone chimes hanging from it. 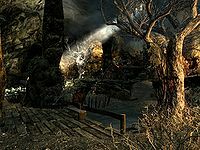 The exterior of the redoubt is home to a small camp of Forsworn. There are only two leveled Forsworn; one melee and one archer located in the camp outside for you to kill before moving into the interior of the redoubt. There is an iron ore vein located upstream from the camp on the southern shore, near a nirnroot, and three growths of blisterwort fungus to the sides of the entrance to the cave. Upon entering there is a short tunnel with an iron ore vein a few steps ahead to your left, before emerging into the main cave, you will then have to cross a small stream via a bridge. The cave consists of three ascending ledge, with two paths leading up to the rear of the cave. 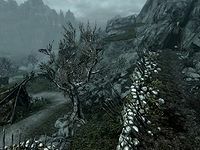 On your left as your cross the bridge is a row of weapon racks holding a Forsworn bow and axe. Alternatively you can try and sneak around the bridge and onto the other side. After you have crossed the bridge there is a small farm consisting of fourteen potato plants, a goat, a grain mill and a wood chopping block, that is tended to by a single Forsworn. There is a table near the mill with a bucket containing potatoes and a Forsworn sword on top. To the right of the wood chopping block is a rack holding the salmon, a rabbit and pheasant. There are two quicksilver ore veins along the northern wall beside these potatoes. Against the rear wall of the cave is a second tanning rack. To the left of this is another tent containing an unlocked chest (where any items you are sent here to recover will be located). Towards the front of this tier, against a large pillar of rock, west of the campfire is a set of shelves holding a copy of the Light Armor skill book The Rear Guard, a random magicka potion, a deer hide and some more meats. To the right of the shelves on the ground is a wolf pelt. Against the northeast wall of the cave is a long wooden table with a map of The Reach showing the locations of all Forsworn camps, a random enchanted dagger (see bugs), four loose gold coins, two lockpicks and a deer hide on top. 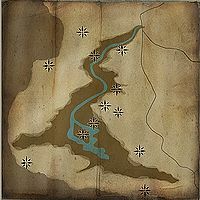 Activating the map plots the locations of any undiscovered Forsworn camps, after which the map disappears from the table.